I want to share my excitement over being addicted to walking with you, fellow Kansas Citians! I still don't have a running bra, folks (TMI), so I will not be found jogging the 'hood anytime soon. Maybe when I'm 50. I'll be posting upcoming walk/runs as I find them. This does not mean I'll be participating in all of them, so don't show up expecting me to sign copies of my Tater Tot Casserole book or anything ... ha! I MIGHT or MIGHT NOT be there, depending on household funds at the time (it costs to enter a race but, oh, the free and healthy goodies at the end and would they please start giving V-neck T-shirts for races for the women so we don't all look like dudes? ), Mr. Kerrie's travel situation, my sanity level, etc. Enjoy the race info, and go out and find some in your town! 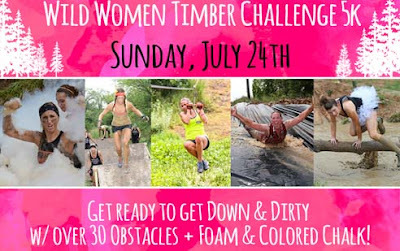 When: Sunday, July 24, 2016 at 8:00 a.m.
"The 3rd annual Wild Women Timber Challenge (WWTC) is the ONLY 5k mud run/obstacle course just for HER. This year we are pushing you even harder with a new course layout and the behemoth Schutte Lumber giant. The WWTC course is not just rugged or tough… it is WILD! Come push your team to the limit and have a great time doing it. Be prepared for well over 30 course designed obstacles and literally countless more provided by Mother nature. We are talking about 100 ft bluff climbs, handheld zip lines, mud pits, the infamous wrecked vertigo bus and so much more. But don’t take our word for it. Check out our Facebook 5 STAR reviews and all the awesome pictures from last year. We are taking the foam and color runs to a whole new level. Our foam pit is a legit obstacle and colored chalk is worn as a badge of defeating the beast of a course. Do you have what it takes?" Check the link (above after WHAT) for more info! Are you planning on giving this one a shot? I'd love to hear from you in the comments! P.S. I get my info from the fabulous KC Running Company website. When you're all done, you'll be hungry! 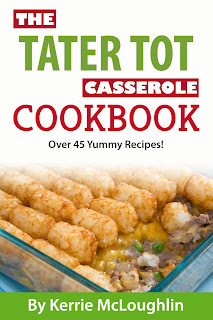 Grab a copy of my Tater Tot Casserole Cookbook and whip up a batch of happiness for dinner!